While the illustrations on the cards are cute, it’s hard to believe they can rival MarioKart. What will make kids want to jump around while playing an analog card game instead of, say, an Xbox or a Playstation 4, the very games that keep kids on their butts in the first place? “Our research when designing this game led to two main insights: kids love to be silly, and they love to tell other people what to do,” Ifung Lu, a designer at the HELIX Centre, says. HELIX is an innovation team based within London's St. Mary’s Hospital, and it was jointly founded by the Royal College of Art and Imperial College. Ujinga gives kids an opportunity to be as bossy and as ridiculous as possible, behaviors often discouraged in classroom settings. “One little girl we tested the game on told us, ‘I love making my friends do stupid things,’” Lu says. For a 5-year-old, the opportunity to boss around 8-year-olds for an hour might be more appealing than watching TV. For a 5-year-old, bossing around 8-year-olds for an hour might be more appealing than watching TV. The gameplay is simple: each kid, starting with the youngest, takes a turn being the ringmaster. They draw five action cards and three descriptor cards (i.e., slow motion, double time), and combine them into ridiculous physical comedy routines. The ringmaster tells the other kids what to do based on the cards—for example, frog jumps plus air guitar plus robot dance, all in double time. (Wild cards let players come up with their own activity.) The ring master then rates her friends’ performances, choosing the funniest, the silliest, the fastest, and gives each one cards as rewards. Kids try to one-up another. Then, they move on to the next ringmaster. When the deck runs out, the player with the most reward cards wins. 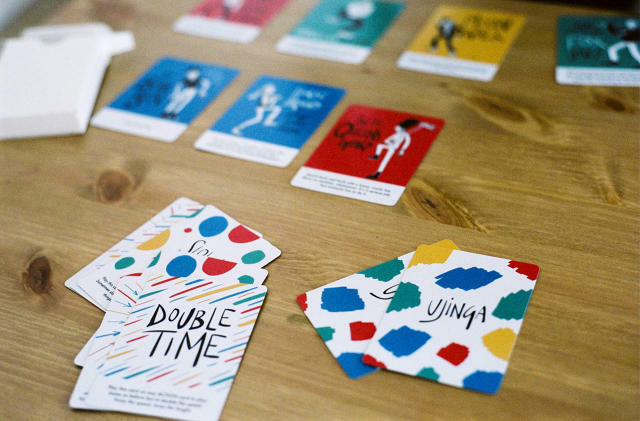 The cards are illustrated in primary colors, with pen-and-ink sketches of characters dancing/hopping/spinning. The style is reminiscent of a children's picture book. “Moving is no longer exercise, it’s play,” Lu says. “Kids love the social element of the game.” The team didn't conduct research on whether playing the game directly affects weight loss. “We don’t want the game to be branded a game for ‘fat kids'—rather, it’s about getting all kids more active,” Lu says. 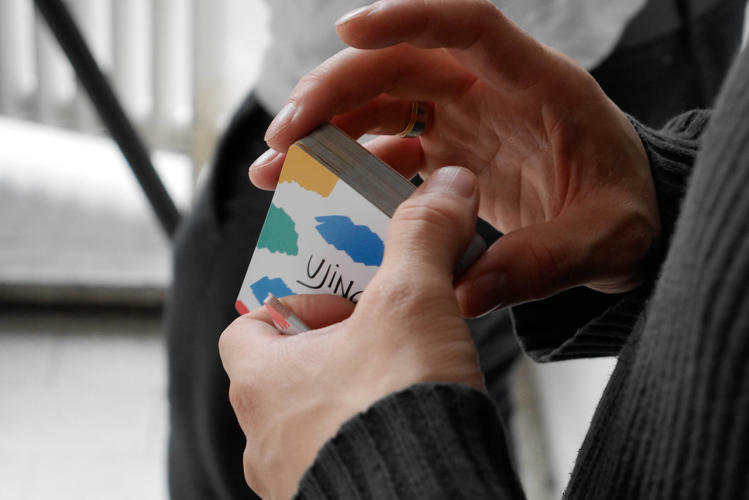 Ujinga is currently available for purchase on Kickstarter for $15.